The dry weather pattern ends today as showers and thunderstorms return to the forecast. It's been a dry, stagnate weekend with little opportunity for rain, but that ends today as the dry air over south Lousiana is flushed out by the returning Gulf moisture. Storms were already breaking out this morning across portions of the Mississippi Gulf Coast and areas east of New Orleans along I-59 and I-10 causing major traffic problems. The atmosphere has been void of any activity over the last several days, so look for pop-up thunderstorms to contain dangerous lightning and locally heavy rain in some areas. The chance of rain today stands at 50% and the showers will begin breaking out around the 2:00 PM and likely last into the late evening. A few models were suggesting that some random storms could hang on into the 10:00 PM time frame tonight. Rain returns for Tuesday on the order of a 70% chance and we should experience much more activity as a cold front makes it's way toward Lousiana over the next 48 hours. This front will be the focus of the shower and thunderstorms until it clears the area late Wednesday night and ushers in another dry period that could last into the Fourth of July holiday weekend. 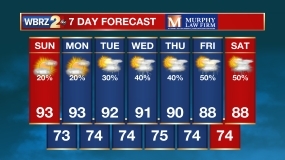 The heat index will also be a factor over the next few days with temperatures coupled with abundant moisture could push the heat indices to between 105-110 degree on Monday and Tuesday.